I'm on vacation on the Right Coast, and my first stop is the Hamptons. This Long Island enclave is synonymous with New York City pretention a la Gwyneth Paltrow. From the first time I visited last year, I was hooked. Although I'm more of a Montauk kind of girl—I like the ruggedness of its beaches and the isolation of the community—I'll take East Hampton for a day of shopping. In the Hamptons, you can see Beyoncé riding her bike down a beach lane, while eating a lobster roll with a retired Long Island firefighter at Duryea's Lobster Deck. I'm sorry to report that I'm not going to be writing about a Salt Lake City shop today, but I want to leave you with some thoughts about travel to a shopping destination in Mexico called Sayulita. The beaches are tranquil, the vibe is authentic, and the shopping is hippie chic. Delta Airlines offers a direct flight to Puerto Vallarta, and it's an easy 45-minute drive north to the sleepy but stylish jungle surf town of Sayulita. Ditch your car, put on some flip-flops and hop into your golf cart, because Sayulita is best seen at a slow pace. If you like high-rise resorts or condos, don't bother going. (Better yet, forget I'm writing about this place: surfers and wanderlusters want to keep it their little secret). I'm not embarrassed to say that the main reason I come to Sayulita is for a singular store named Pachamama (@pachamamasayulita). In my lifetime, I have been to only a handful of stores that make my heart swoon, and Pachamama is one of them. Owned by the famed French bohemian Mignot sisters, Nathalie and Marie, Pachamama is named after a goddess revered by the indigenous people of the Andes. She is Mother Earth. This store is the epitome of gypset (a portmanteau of jet set + gypsy, "gypset" is a term coined by New York Times columnist Julia Chaplin in her book Gypset Style). The Mignot family sailed the world for 10 years in a wooden boat and collected treasures along the way, finally settling with their children on the best surf beach in Sayulita. The children are surf legends who walk around looking effortlessly chic as if members of an exotic love tribe. 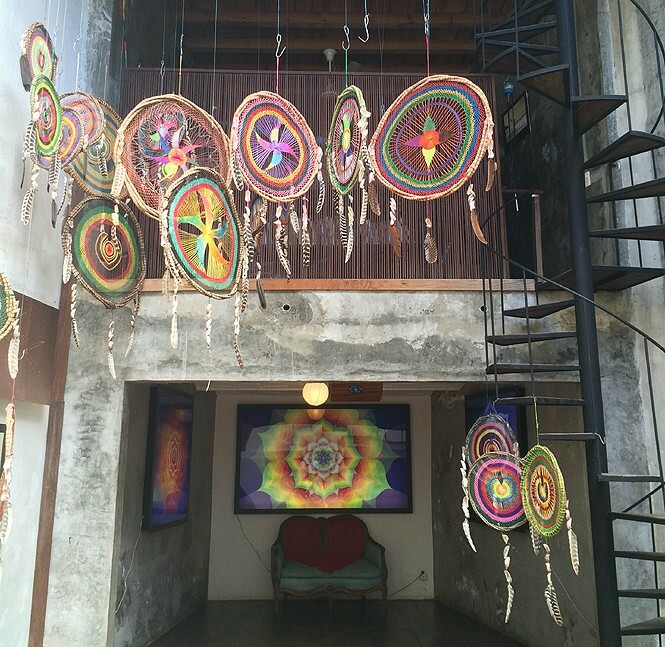 Leading up to the store are vibrantly colored dream-catchers strung with local shells and feathers. A tribal pattern is painted on the shop's the wooden floor. There are Tahitian pearls strung on leather cord, leather fringed boho-chic satchels, sister-made tie-dye dresses and cover-ups, shirts and bags emblazoned with "Love What You Live" and "Be More Now." The most important statement piece is an interpretation of a traditional, hand-embroidered Mexican wedding dress (pictured above). You, too, can live like a gypsy and rent a room above the boutique at Pachamama Casa Love, or stroll around and enjoy the art gallery. Unique bathing suits and coverups. For housewares like antique pots and throws. Colorful beach blankets, pompoms, Frida Kahlo T-shirts and handmade embroidered bags inspired by the Huichol Indians. Yarn-painted cattle skulls, beaded macramé wall hangings, beaded crystal jewelry.